The Provincial Bank of Ireland was established in 1825, pioneered branch banking in Ireland. The terms, rights and privileges of the Bank of Ireland allowed it to effectively strangle the development of banking in Ireland until the Irish Banking Crisis that followed the post-Napoleonic War Depression. 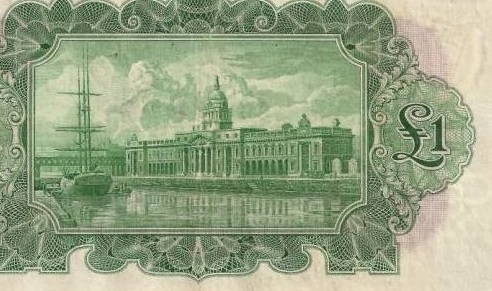 The Bank of Ireland effectively held a monopoly within Dublin and the surrounding areas within a radius of 50 Irish miles – it did not issue banknotes outside of Dublin until 1824. 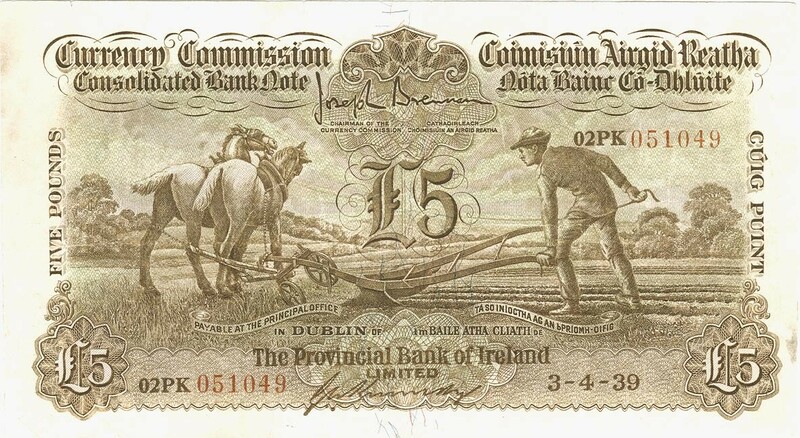 As such, there was a shortage of currency in the country outside of the Dublin and Ulster areas in the years prior to this. Until the Provincial Bank of Ireland was founded in 1825, the Bank of Ireland made little or no attempt at expanding its branch network and it used its status as a quasi-Central Bank (or, lender of last resort) to suppress the development of branch banking in Ireland right up until the 1880’s. 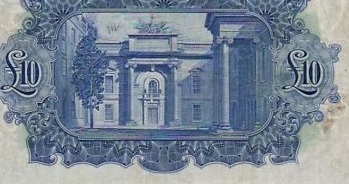 In 1845, a period of financial crisis prompted new legislation to regulate the issue of notes. 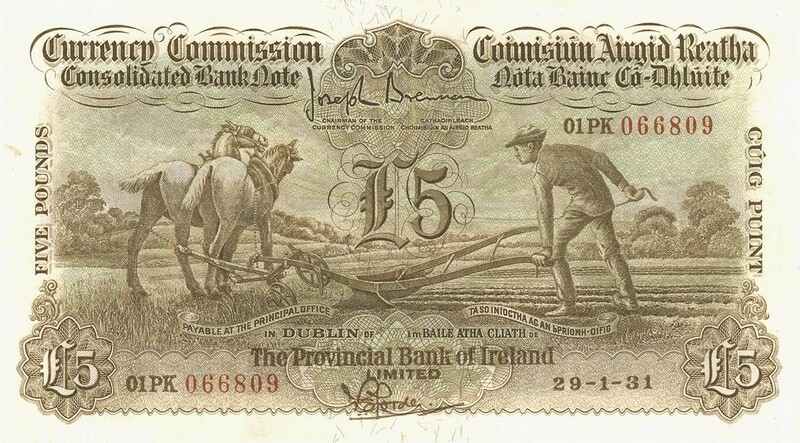 Only six Irish banks were authorised to issue banknotes and this new law allowed notes in ’round pounds’ only, so banks had to withdraw (over time) any of their banknotes in guineas, fractional guineas and such oddities as 25s, 30s and 35s denominations. 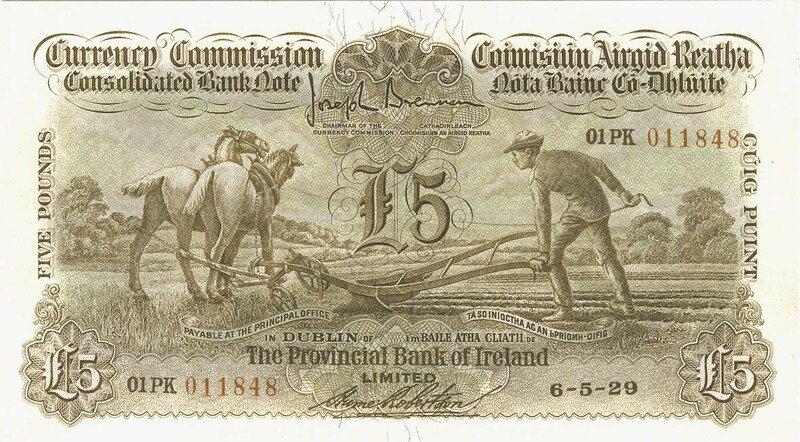 The ability to print their own banknotes gave these banks a huge commercial advantage over their new and emerging 19th C rivals – the Provincial Bank of Ireland was one of these six banks. 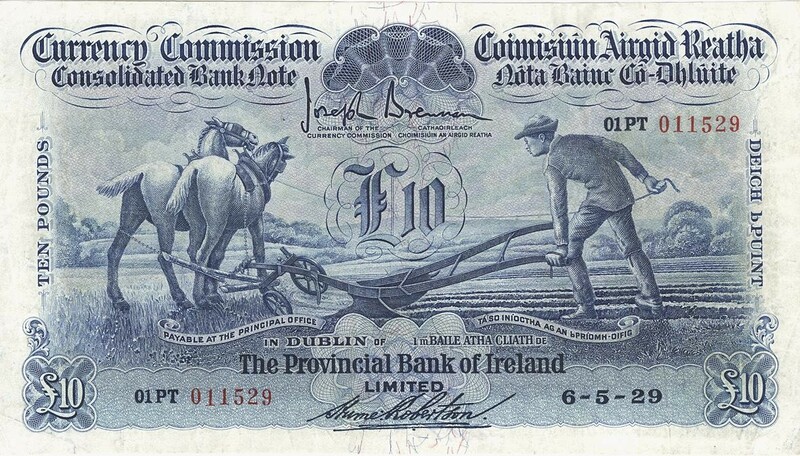 In 1920 the Banknotes (Ireland) Act ended the practice of making notes payable only at specific branches. Instead, notes could be redeemed at a bank’s head office. This meant there was no need for banks to list all of their branches on their banknotes any more – just the location of the bank’s principal offices. 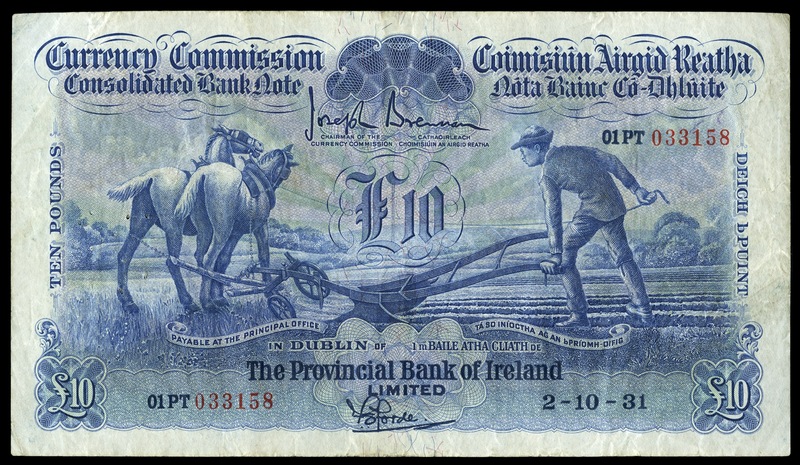 In line with this new legislation, most banks issued a new series of banknotes from 1920 onward – the Provincial Bank of Ireland was one of six banks affected by this legislation. With the inauguration of the Irish Free State on 6th December, 1922 these six banks continued to have the right to issue banknotes in Ireland. Shortly afterwards (in 1923) the Belfast Banking Company sold its Free State business to the Royal Bank of Ireland, which in turn bought the Northern Ireland business of the Royal Bank. 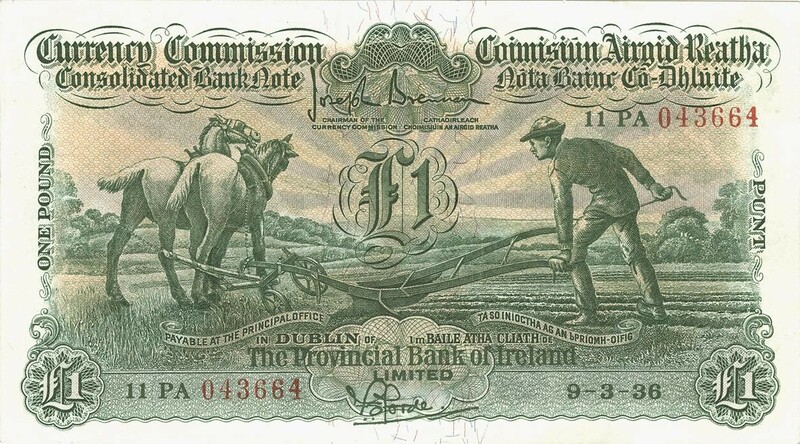 The Currency Commission (Coimisiún Airgid Reatha) of the Irish Free State, was created by the Currency Act, 1927 (Section 14) as part of the policy of the Irish Free State to set up and issue its own currency, sometimes known as the ‘Saorstát pound’. 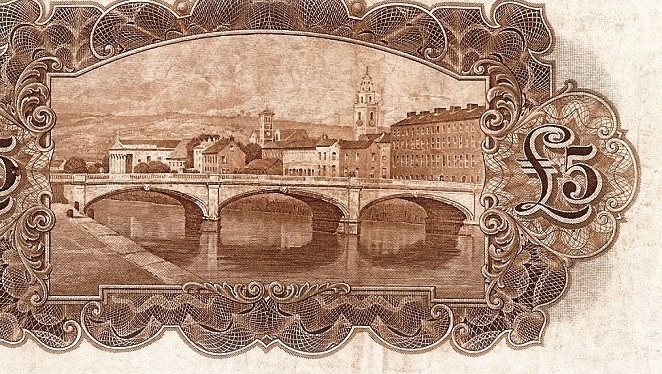 The Currency Commission commissioned the “A Series” Banknotes, through the advice of an advisory commission. The new Currency Commission had a problem insofar as the five banks operating in the newly declared Irish Free State also operated in Northern Ireland, so withdrawing their existing banknotes was not a simple operational or legal matter. In appearance, they were Irish Free State Pounds and the Bank of England guarantee was based on bullion deposits owned by the Irish Free State but held in London by the Bank of England. The ‘promissory notes’ issued by the eight banks operating in Ireland were also backed by ‘specie’ held in the vaults of the Bank of England in London. 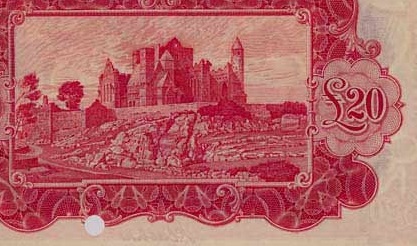 This covered notes used in Northern Ireland, as well as the Irish Free State. 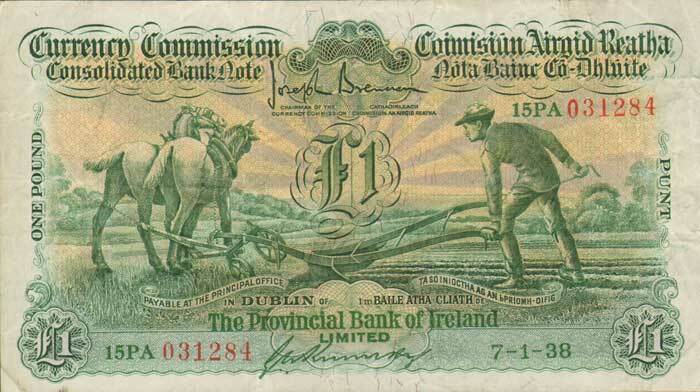 The other ‘new design’ would comprise the new Consolidated Banks series (or ‘Ploughman’ notes) for the Irish Free State. 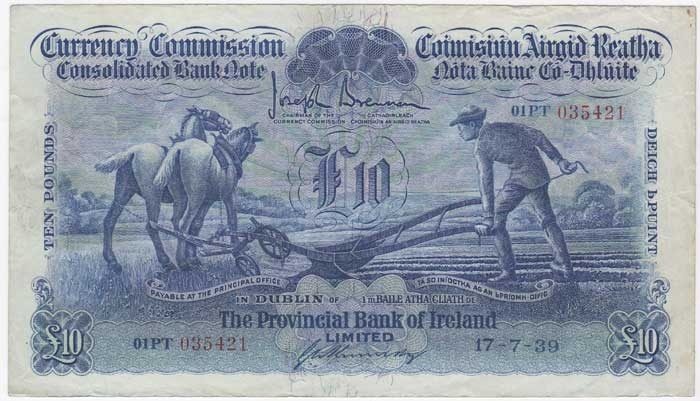 A set of six banknotes were issued – ranging from £1 to £100 for each of the eight Consolidated Banks – the Provincial Bank of Ireland only issued £1, £5, £10 and £20 notes, i.e. no £50 or £100 notes were produced for them. The size of the banknotes increased slightly with each increment in denomination. 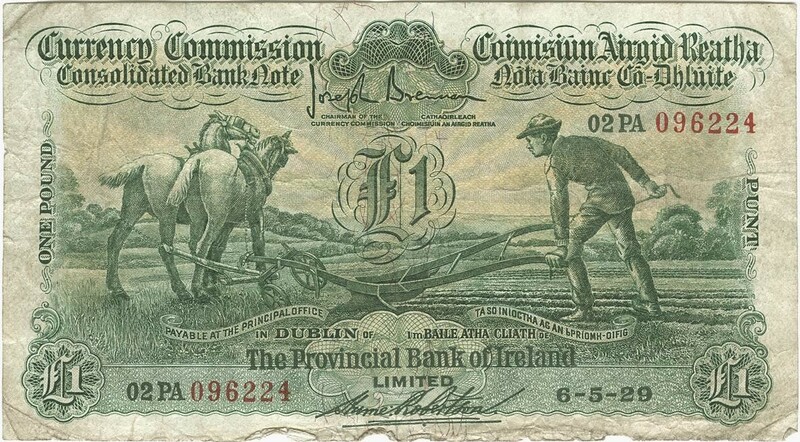 There are no Type 2 or Type 3, Provincial Bank of Ireland £20 ‘ploughman’ notes as none were issued after 1929.